As Principal Designer and Founder of Terri Long Landscape Design, Terri brings a wealth of design and project management experience to your project. Terri is a North Carolina Certified Plant Professional and North Carolina Registered Landscape Contractor. Following a rewarding seventeen-year career as an interior designer in Atlanta, Georgia, Terri combines her experience in project management, color theory, design, construction administration and excellent customer service with education in Ornamental Horticulture at Haywood Community College to create artistic, yet functional, landscapes. Terri Long Landscape Design can turn your landscape problems into beautiful gardens and outdoor living spaces that enrich your life. Imagine a landscape that enriches your life. A place where you can relax and feel nurtured. Let Terri Long Landscape Design transform the idyllic garden in your imagination into an inviting, outdoor living space that becomes a haven for you, your family and friends. Unleash the hidden potential outside your doors. Contact us today for a complimentary consultation and discover how your life and home can be enriched with a personalized landscape designed by Terri Long. 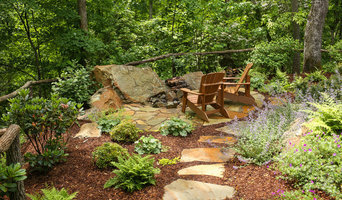 Asheville's Full Service Landscape Design 3x Best of Houzz! 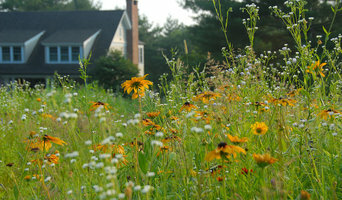 Gardens For Living is a Landscape Design, Installation and Maintenance company based out of Asheville, North Carolina. Gardens For Living was founded by John Phillips in 1983, fueled by the desire to collaborate with clients to create landscapes that are exceptional in form, function, and beauty. Thirty years later, we continue to design and install landscapes that enhance the lives of our clients all over Western North Carolina. We are known for our intuitive design (uniquely created to fit each individual space), our creativity throughout the process, and our steadfast attention to detail. We take great pride in the ongoing relationships we have formed with our clients over the years. It is a privilege to maintain their landscapes and see them grow and evolve, as every great garden should. TTK DESIGN is a landscape architecture firm that strives to balance design and the natural environment with client desires, program requirements, and budget. Our scope of work includes planning, design, and construction management of residential, civic, institutional, and commercial projects. It is our passion to create award-winning designs that are beautiful, functional, and memorable. Semi-retired to Jonesborough in 2004. Previous professional landscape architecture firm designing projects in the east from Florida to Massachusetts. Designs included residential, commercial and institutional. Click my website button for more examples of designs, photos and information. We are a unique landscaping company that specializes in Artful Design and Installation. Our goal is to create welcoming, innovative, and exciting garden spaces with room for outdoor living and family fun. Beginning with waterscape design and build services (ponds, waterfalls, water gardens, fountains & more,) Liquid Landscapes has evolved to a full service landscape company with the highest standards of quality and workmanship. Many companies provide components of landscaping services. Granted, some of these companies do a reasonable job on a project basis, but it’s just a task and then they move on to the next task. It’s not their objective or their lifeblood to envision your landscape at its full potential, to increase the value of your property, or to develop a long-term relationship with you as a client. Although you may invest in a costly project, they may not be around the next time you call them. Liquid Landscapes, Inc. is different…and it’s that single reason we are still here today. We are in the business for the long haul, offering a full range of services and landscaping products to a client base that values quality work and professionalism. We envision each project as a blank canvas that beckons to be transformed into art, sculpted with nature. Transforming ideas into reality through creative, thoughtful, and environmentally-sensitive design since 1995. Services include designing and managing landscape architectural projects from concept through construction. As Landscape Architects and Land Planners, Broadbooks Associates will work closely with your land to create an outdoor environment that enhances your lifestyle and home value. With over 65 years of combined experience, our knowledge of construction and related design disciplines enables us to collaborate effectively to your benefit. From creating a site for your home plan to maximize views and limit grading disturbance to minimizing future landscape maintenance, we have the expertise to solve problems on paper, or in cyberspace, before they become a construction problem. Whether you're building your dream home, wish to create a new outdoor living space, or want to revive your bowling ball landscape, Broadbooks Associates will work to ensure your needs are met. We commonly work electronically with clients from around the country, so don’t hesitate to call. The more compact your site, the more you need Broadbooks Associates. Vision Design Collaborative P.A. is a Landscape Architecture, Land Planning and Project Visioning firm located in Asheville, North Carolina. We believe in a collaborative, highly visual design process that takes a comprehensive and thoughtful approach to identifying the unique opportunities and constraints of each project. Our goal is to provide highly creative design solutions that are highly functional, beautiful, and conscious of impacts to the environment. We have over 20 years of planning and design experience in planning and design in complex mountain environments. Since 1995, we have helped our clients transform their visions into reality, focusing on aesthetic beauty, function, and value. We pride ourselves in maintaining the highest standards by integrating our knowledge in horticulture, creative design, and industry leading landscape techniques. The design process starts with function, shape, and flow. Structure is added by introducing stone, walls, water, arbors, and destination garden rooms. With continued client involvement, the mood of the landscape is completed with plant selection, color, and texture. Satisfaction, value, and customer relationships are what drive The TPS Landscaping staff. Each new landscape encourages us to become the best at what we do. Charles Godfrey Landscape Architects, Inc.
For more than 30 years, Charles E. Godfrey, Jr., Landscape Architects, Inc. (CEGLA) has served as one of the longest established landscape architectural firms in the upstate area of South and North Carolina. Projects range from private residential gardens, to institutional and public spaces. Focused on providing a complete product, the design process begins with the client and their needs and a complete understanding of the site. CEGLA is experienced in working with people budgets, current construction techniques, and the design development process. CEGLA enjoys a reputation of producing creative, appropriate design for the enjoyment of all. Landscape magic with an understanding and sense of place. Pinnacle Landscapes is a design/build/ maintenance firm who strives to provide the most creatively designed, innovative landscapes possible, with the best service and value available. Jay Marino is a licensed Landscape Architect and contractor with over 30 years of building experience and expertise. Doesn't it make sense to use a designer with an understanding of building principles and a builder who understands the intricacies of design?! Design Associates specializes in custom residential landscape design. We are a start to finish Landscape Architectural company bringing professional knowledge and expertise to each individual environment. The team is passionate about creating beautiful, sustainable, and functional outdoor spaces and providing the ultimate customer experience. The work of this outdoor professional includes most everything surrounding a home's exterior. 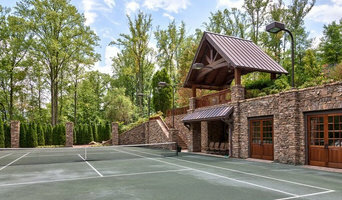 A landscaping architect can even work with the home architect to choose the right spot for your Weaverville, NC house. From there the Weaverville landscaper will develop preliminary concepts for your front or backyard design based on individual needs including the climate and activities that will take place, as well as layouts and planting plans. Landscape architects will also design any structures or outbuildings that will be added to the space. Any grading changes that will be added to the yard are also the responsibility of the architect. This includes any drainage modifications. An engineer can also be responsible for these tasks, but licensed North Carolina landscapers are fully capable. Like building architects, they will produce preliminary concept drawings as well as detailed construction documents and planting plans. Three-dimensional renderings and illustrative plans are all supplementary. A Weaverville landscaping designer generally will have ecological, aesthetic and technical training, which helps them maximize the potential of your outdoor space. Keeping in mind both style and functionality, garden designers analyze your architecture and yard to produce a plan that may or may not include location and materials for walkways, patios, water features, fences, garden aspects and more. In addition, a landscaper in Weaverville, NC will carefully assess your geographic region to choose plants, trees and flowers that will flourish naturally, as well as address concerns such as drainage, screening and soil conditions. Certain landscape designers only help with the planning portion, while some may deliver the plans and then oversee a hired landscaping contractor. Others — typically following a design-build approach — take care of both the design and all aspects of the landscape architecture and construction. Before you hire a North Carolina professional landscaper, consider the scope and emphasis of your outdoor project. Landscape architects, who typically hold advanced degrees in their field, are trained to develop comprehensive structural plans that include plants, hardscaping, water use, drainage and more. Landscape designers typically specialize in the aesthetic and horticultural, rather than structural, side of yard and garden planning. They might or might not have advanced training. Even within their fields, a garden designer may specialize in hardscape- or vegetation-focused designs. In some cases you might need to hire additional help to get the outdoor space you want. Here are some related professionals and vendors to complement the work of landscape architects & landscape designers: Landscape Contractors, Garden & Landscape Supplies, Tree Services, Gardeners, Lawn Care & Sprinklers, Decks, Patios & Outdoor Enclosures. Find a Weaverville landscape architect on Houzz. 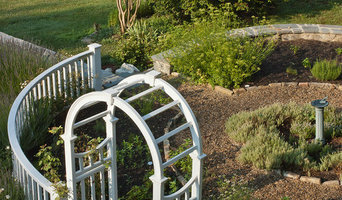 Narrow your search in the Professionals section of the website to Weaverville, NC landscape architects and designers. You can also look through Weaverville, NC photos to find a space you like, then contact the professional who posted the photo.